Although this ten day tour of Cambodia is designed for travellers on a budget, it doesn't scrimp on authentic experiences and insightful interaction. Visits to Angkor Wat and Phnom Penh provide just a couple of locations to digest the past and appreciate the endearing nature of local people. From snorkelling in Sihanoukville to village homestays, this small group holiday in Cambodia is designed for budget travellers, and includes all accommodation and travel arrangements organised in advance. Groups can enjoy a secure and sociable experience designed for those lucky enough to be aged between 18 - 30yrs old. Low Impact Transportation: This trip gives you the chance to try out the local bus from Siem Reap to Phnom Penh, overnight sleeper trains from Saigon to Nha Trang, Nha Trang to Danang and Hue to Hanoi, you also will have the option to do a cyclo ride around the center of Phnom Penh and using the local tuk tuks to get around in Phnom Penh and Siem Reap. Getting around as the locals do not only allows you to experience the culture on a deeper level, but the same way it is at home, using public transport is the most sustainable way to go – after walking and cycling of course! Supporting local culture and businesses: There are a multitude of opportunities to support local businesses and immerse yourself into the culture of Indochina on this trip. From the colourful markets to the bustling food stalls and cafes, the choices for eating and handicrafts are endless and the money is staying in the local economy - a vital way for tourism to make a positive impact. Activities that take you to markets, locally-owned restaurants, locals’ homes and villages are vital to the local peoples’ ability to truly benefit from tourism. Our style of trip, travelling, eating and staying with the locals, puts you right at the heart of the culture in Lao, Vietnam and Cambodia. In Siem Reap on day two we will have an included local meal either at New Hope Cambodia (Planeterra project) or in a small village outside Siem Reap. Chatting with the locals will give you an amazing insight in local life. It may not be apparent that learning about and respecting other cultures is part of being a responsible traveler, but we believe that this discovery is a natural way for people of all backgrounds, nationalities, and religions to interact and learn from each other, fostering peace and understanding. And it’s just plain fascinating! 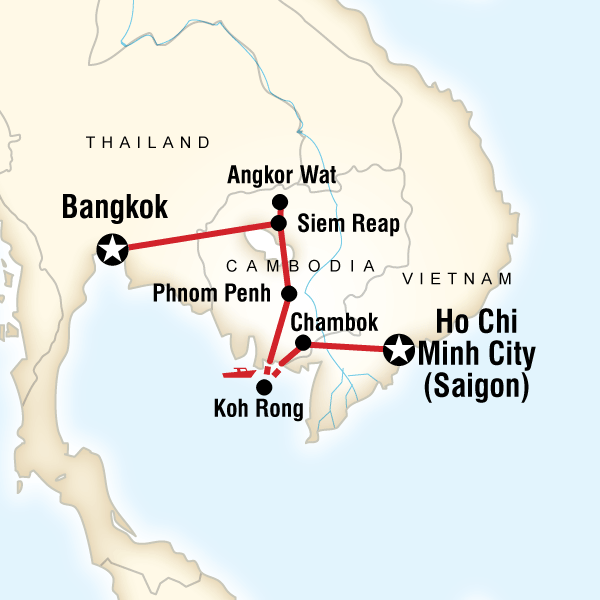 Other optional unique experiences on this trip that allow you to support the local economy and learn about Cambodian and Vietnamese culture include: A boat tour up on Tonle Sap lake in Cambodia to see how local people live on the lake either on floating houses or on houses on stilts, boat trip in Shianoukeville, enjoy the riverside in Phnom Penh in the afternoon where you can see the locals doing exercise, dancing, having pick nick and enjoying them self. If you like you can join in. Another option is to visit Toul Sleng prison and the killing fields in Phnom Penh to learn more about Khmer Rouge and what happened during the time between 1975 and 1979.